On June 18 last, 35,000 flocked to Chantilly to attend the most glamorous event of the year: the Prix de Diane / the Diana Stakes. Ever since 1843, this horse race has been attracting the fastest three-year-old fillies in the world: horses often owned by the biggest billionaires of the planet. 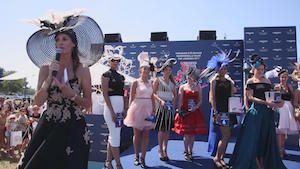 But the Prix de Diane is also a chic get-together, where the prettiest outfits are reward during a fashion competition. Henri-Alex Pentall, one of the best trainers in France, will be presenting Sister Charlie, an English thoroughbred filly costing over a million Euros. Against her, Mademoiselle Marie, bought for a quarter of the price and trained at a modest stable in Marseille, could create a surprise! Lining the track, the hats, each outdoing the other in extravagance, swarm over the lawns. This year, Céline’s – a milliner near Rouen – order book has gone through the roof! No fewer than twenty women will be wearing her creations at the Prix de Diane. A celebrity that she owes to her victory in the 2016 fashion competition. Will Sophie Thalmann, former Miss France and president of the jury, grant her a second consecutive victory?